Wesley Tower Condos is a new condo development at 360 City Centre Dr, Mississauga ON located right at City Centre Drive and Confederation Parkway. 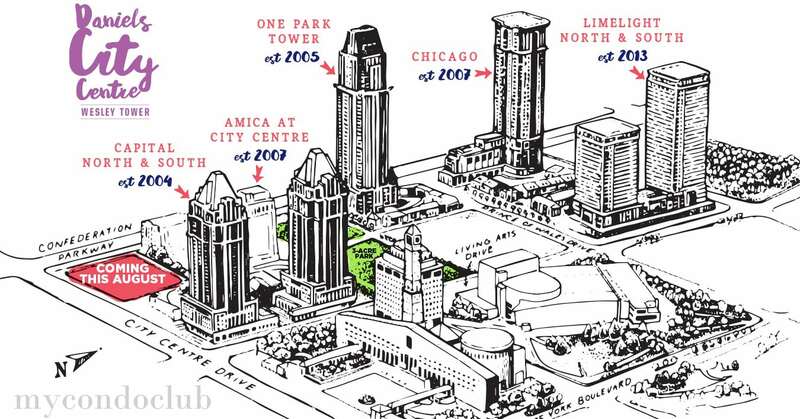 A new condominium by The Daniels Corporation will have 506 luxurious condo units in a 43 storey tower. Summer 2020 is the expected residing year for Wesley Tower Condos. Wesley Tower Condos - The latest addition to the Daniels City Centre in Mississauga. This condo will be surrounded by a 3-acre community park. 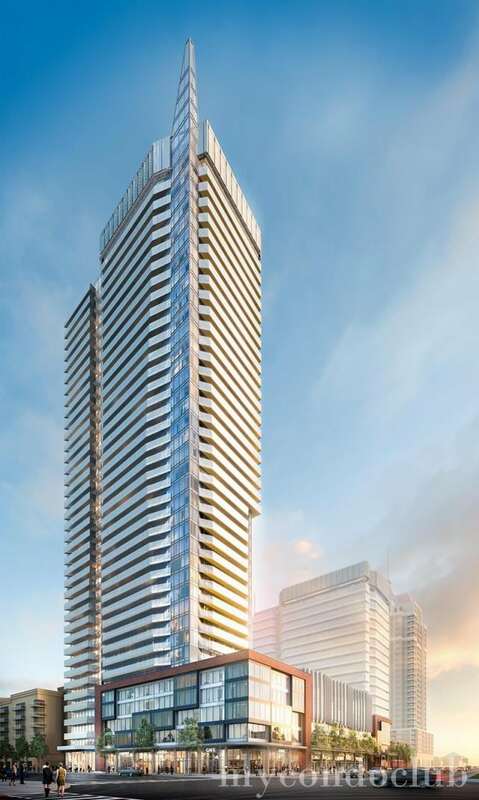 Wesley Tower Condos by Daniels will be in the most attractive and happening zone of Mississauga. Very close to the Living Arts Drive. Based in the 6th largest city of Canada, this condo is at the center of all major attractions and amenities. It provides access to all the basic necessities to its residents along with its retail space. With its unique modern look, Wesley Tower Condos has only best to offer to its residents in Mississauga. Located at the core of Mississauga's City Centre, it also, offers all the amenities, malls, hospitals, grocery stores, parks, major highways, retail shops, TTC services and schools. There will be mixed units consisting of studio to 3 bedroom suite designs with stunning views, sophisticated features and finishes. 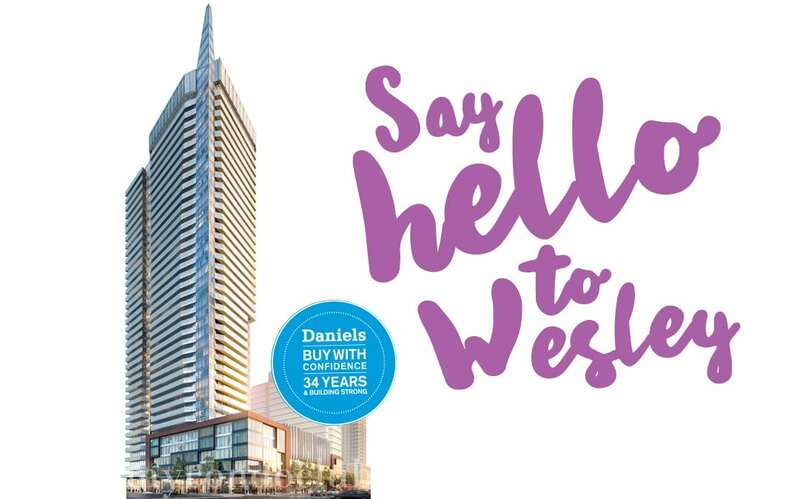 Being a part of the 23-acre Master Planned Community of Daniels City Centre, Wesley Tower Condos will showcase itself as the major attraction tower in the area. Apart from this, pedestrian-friendly pathways, tree-lined streets, a three-acre community park and public art. Shopping at Square One Mall, watch movie at Cineplex Odeon, relish live theatre at the Living Arts Centre, study at Sheridan College’s Hazel McCallion campus, and last but not the least playtime at YMCA and Playdium. A perfect home location for families and friends. The Wesley Tower Condominium is in Mississauga, surrounded by large businesses, numerous offices and neighbourhoods like Celebration Square, Art Gallery of Mississauga, Port Credit, Jack Darling Memorial Park, Streetsville, Mississauga Central Library, Lakefront Promenade Park, The Riverwood Conservancy, Brueckner Rhododendron Gardens, Meadowvale Conservation Area, historic Bradley Museum, the Adamson Estate, the Benares Historic House, Meadowvale Theatre, Lakeside Park, the Leslie Log House, The Mississauga Golf & Country Club, BraeBen Golf Course, Lakeview Golf Course, the Mississauga Heritage Foundation, the Hershey Centre, and the Egyptian Museum. Best places to shop in Mississauga are Square One Shopping Centre, Erin Mills Town Centre, Dixie Outlet Mall, and the oldest market in Mississauga - Fantastic Flea Market. Lots of cafes and restaurants for a quick bite or dining like Piatto Bistro, Masala Bites, Peter’s on Eglinton, Mondello Ristorante, Union Social Eatery, La Castile Steak & Seafood, The Host, Tu Casa Fine Dining, Snug Harbour Seafood, Ristorante Alioli, Twin Fish, Oliver’s Ale House, Clarkson Mediterranean Bistro, Andiamo Pasta Plus, Grano Ristorante, Walkers Wine Bar & Grill Seafood Restaurant, Saucy, Michael’s Back Door Restaurant, Zorro’s, Casalinga Ristorante, and Bistro Narra. There is a 100/100 WalkScore. Few minutes walk to the Sheridan College – Hazel McCallion Campus from Wesley Tower Condominiums. Also, the nearest stations are in neighbouring Brampton, Toronto, and Oakville. Commuter rail lines on Lakeshore West, Milton, and Kitchener. Public bus service served by MiWay has over 90 routes throughout the city. Highway 401, Queen Elizabeth Way, Highway 407, and Highway 427 are so close to the Wesley Tower Condos. Cookville GO Station is just few minutes drive away. Mississauga Celebration Square is a massive attraction for public gatherings, events and concerts in Mississauga. Close access to the central GO Bus Transit Station and few steps to the brand new Sheridan College Campus at Square One Mall. Queen Elizabeth II Jubilee Garden, Living Arts Park and Zonta Meadows are some of the parks close to the Wesley Tower Condos in Mississauga.